OSP provides several stand-alone applications for physics teaching and student activities. These tools are designed for the creation of curricular packages or to support student modeling and laboratories. Develop a prototype of an application in order to test an idea or algorithm. Create user interfaces without programming. Create models whose structure and algorithms non-programmers can inspect and understand. Encourage students or colleagues (who may be new to Java) to create their own simulations. 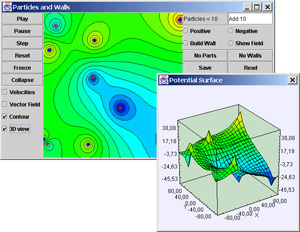 Quickly prepare simulations to be distributed as applets or as stand alone programs. Create a package containing multiple programs and the associated curricular material.